More than 50 conference clergy and church administrators attended a tax seminar hosted by the United Methodist Foundation of Louisiana Feb. 20 at First United Methodist Church in Pineville. Amy Hume, a CPA with more than 30 years of experience helped clergy with issues relating to income tax return preparation, and taught church leaders and church business administrators about basic church finance and legal implications. Hume is a principal with UHY Advisors TX, L.L.C. in Houston and married to a United Methodist minister. The first half of the program addressed primarily the tax breaks afforded to United Methodist clergy. In the second part, she discussed basic church finance and accounting, including payroll administration, forms, documents and procedures related to the financial management of churches and their related ministries. Located in Baton Rouge, the United Methodist Foundation of Louisiana was founded in 1975 and serves United Methodist churches, institutions and individuals within the Louisiana Annual Conference, providing financial management, consultation and education, loans and grants. It is one of the largest United Methodist Foundations in the denomination. Rev. 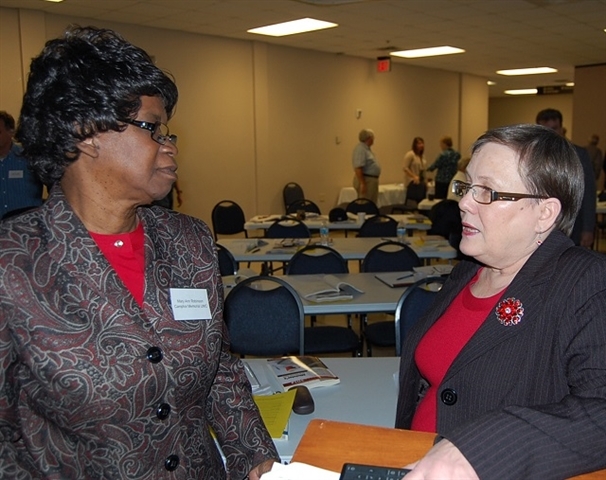 Mary Ann Robinson (L) of Camphor Memorial UMC discusses clergy income taxes with speaker Amy Hume (R) at the Foundation’s Income Taxes for Clergy seminar, Feb. 20 at FUMC Pineville.